← Why Aren’t Other Dioceses Looking to Lincoln? Many Catholic faithful over the last forty years have seen the all too common utilization of Extraordinary Ministers of Holy Communion during the Mass. An innovation from the 1970’s intended for occasional use in emergency situations, these extraordinary ministers have indeed become quite ordinary in your ordinary parish Mass on any given Sunday. Sadly, this modern practice has contributed greatly to the blurring of lines between the sanctuary and the nave, as well as between the ordained and the laity. 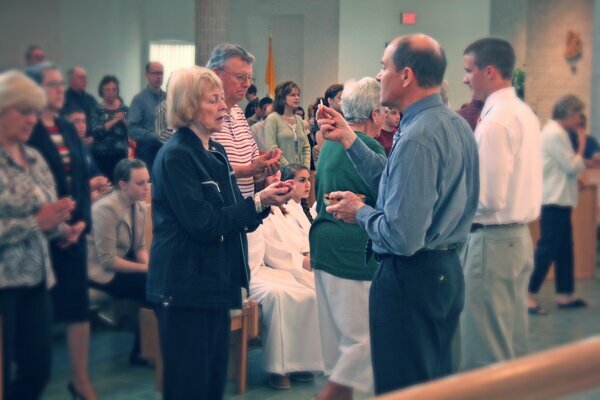 There is an immediate way to reduce this abuse of the current practice; an approach that has already been implemented in some parishes and which reduces the need for many of these extraordinary ministers: stop distributing Holy Communion under both kinds at Mass. If we the faithful receive our Lord entirely (body, blood, soul and divinity) when we receive the consecrated host, then why is it necessary to stand in line for an Extraordinary Minister to give us our Lord entirely (again) in the chalice? The Church further stated at Trent that “those who receive one species only are not deprived of any grace necessary to salvation.” That being the case, why do so many parishes unnecessarily create a need for Extraordinary Ministers by offering Communion under both kinds at every Sunday Mass? A common theme I often write about is the need to reestablish consistency between the two forms of the Roman Rite, as well as recovering continuity with our liturgical heritage. Many parishes are already incorporating this approach. Since the Traditional Latin Mass does not permit for either the use of Extraordinary Ministers of Holy Communion, or the offering of the chalice to the faithful at communion, the implementation of this suggested reform would create further visible consistency between the two forms of the Mass. In our continuing effort to restore a sense of the sacred to the liturgy, let us pray that this ordinary use of extraordinary ministers soon becomes a thing of the past. An earlier version of this article was originally published August 26, 2013. Posted on May 5, 2016, in liturgy and tagged Eucharistic ministers, extraordinary ministers of holy communion, immensae caritatis, liturgical abuse. Bookmark the permalink. 43 Comments. “Sadly, this modern practice has contributed greatly to the blurring of lines between the sanctuary and the nave, as well as between the ordained and the laity.” For the reformers, this was a feature, not a bug, I’m afraid. Why was communion under both species the norm for over 1200 years before being taken away from the “second class ” laity? Why is it necessary for the priest to take communion under both species, but the laity is considered not good enough to receive what Thomas Aquins refers to as the fullness of the sacrament? Why is the Roman Catholic Church the only body in all of Chrisendom that by and large denies the cup in most parishes? Why is it universal in the Eastern rites of the Catholic Church as well? Why is communion under both species also the norm in the Anglican use parishes? Call me anathema if you will, but as a practicing Catholic who seeks out churches and parishes who treat the faithful as full members of the Body of Christ, not the just the common people in the pews who pay the bills, I can attest personally, which is all any of us can do in reality, that I feel cheated of the fullness of the sacrament when I an forced to attend a Mass while traveling at which the chalice of the Previous Blood is not made available to ALL of the faithful. Quite frankly, if Ithe Church ever decides to go back to the old ways as is being advocated here, it would break up the Church. We will not go back to the Middle Ages as seems to be the goal of the traditionalist minority dissidents who so loudly proclaim their discontent. Simple answer-heresy, namely the utraquists/calixtines. Read what the Council of Trent said about it, you aren’t getting anything “more” by receiving both. If going back to the “old ways” would “break up the church” than all those people willing to go into schism show themselves to be mere neo-utraquists. The ultra quiets/ calixtines controversies were not until the 15th century, at which time the Council of Constance firmly closed the door on the laity receiving communion under both kinds. The Council of Trent further dug in their heels, decreeing that only one kind, usually the bread, was all the laity needed. But who can blame them. To do otherwise would smack of giving in to the Reformers if they reinstated the ancient practice. But as the as the USCCB informs us in the Norms for the Reception of Communion under Both Kinds…..
“17. From the first days of the Church’s celebration of the Eucharist, Holy Communion consisted of the reception of both species in fulfillment of the Lord’s command to “take and eat . . . take and drink.” The distribution of Holy Communion to the faithful under both kinds was thus the norm for more than a millennium of Catholic liturgical practice. “29. Holy Communion has a fuller form as a sign when it takes place under both kinds. For in this form the sign of the Eucharistic banquet is more clearly evident and clearer expression is given to the divine will by which the new and eternal Covenant is ratified in the Blood of the Lord, as also the connection between the Eucharistic banquet and the eschatological banquet in the Kingdom of the Father. The Bishops further state, which the faithful should take to heart with greater fervor than they do…. With all due respect, if you “feel cheated of the fullness of the sacrament”, perhaps you would be interested in seeking out a seminary and dedicating your life ‘fully’ to God. Perhaps I might. That way I could be assured of getting the Body of Our Lord and His Precious Blood at every Mass I celebrated, since the Church has decided that only the celebrating priest has a right, indeed an obligation, to consume both elements at Mass. But do you think they’d mind if I brought my wife along? Are there living arrangements for married couples on campus at the seminary in the Lincoln diocese? The overriding concern was a balance between hygiene and sacrilege. There are hygiene issues with that from THE chalice, was the traditional responsibility for the deacon, since his hands were not consecrated and as St. Thomas said,”…because out of reverence towards this sacrament, nothing touches it, but what is consecrated; hence the corporal and the chalice are consecrated, and likewise the priest’s hands, for touching this sacrament. Hence it is not lawful for anyone else to touch it except from necessity, for instance, if it were to fall upon the ground, or else in some other case of urgency.” Which speaks to sacrilege. Note that if that is your standard, the average Catholic layman only had Communion at all 4-6 times a year for most of this time period and usually would check with his spiritual director to make sure he was of the right frame of mind. Well., Jay, one experience might suggest that God agrees with you! I was at a Healing Mass, and as part of the music ministry came down last to receive the Eucharist. When it came to the Chalice, the priest looked at me and shook his head, as the Chalice was now empty. Oh, you poor jealous boy. Does the priest get to do something that you cannot do? Did Billy get two cookies and you only got one? Why do all those other churches that are failing or schismatic or otherwise deficient do things differently? Pouting such as this only points to the childishness of those who insist that they are big boys now, and have to do everything everyone else does. How childish. For those with gluten intolerance or gluten allergy sometimes the wine is the only option for receiving Holy Communion. We just had a 1st Communicant who had to go to Communion before everyone else and only receive wine. Respectfully, nobody receives ‘wine’ in the Sacrament of Holy Communion. I am Maronite. Communion is given only by ordained priests or deacons, by intinction. The host is dipped in the chalice and then placed on the tongue of the person). There are no lay people distributing communion, and we never touch the host with our hands; it is always placed directly on the tongue. In addition the linen napkins used at Holy Communion are laundered by hand in basin. Because there may be crumbs or fragments of consecrated host in the wash or rinse water, the used wash and rinse waters are discarded outdoors in the garden, never down a drain. In my region it’s not unusual to see 8 or 10 EEM’s for a congregation of 60. It has become a plum “feel-good” role having nothing to do with efficiently handling large crowds of communicants. In my parish we are blessed with sufficient Eucharistic Ministers and Permanant Deacons to provide the Body and the Precious Blood at seven Masses each Sunday, and two daily Masses, and a Children’s Mass each day for our school children. Sunday Masses all average several hundred communicants, with the exception of the Sunday 7 AM Mass, which may only have a hundred or so early risers. Just about everyone receives under both species, quit a few of us bypass a closer church each Sunday to participate in a Mass where we may participate in the fullness of the sacrament. And exactly why is using Lay people a problem? Many parishes only have one priest and one or two Deacons. Sounds like people who want to go back to “before Vatican II”! The churches were full before Vatican II. Are you in a hurry to leave Mass? James, the problem is that it diminishes belief in the Real Presence of our Lord in the Blessed Sacrament, and blurs the distinction between clergy, who have received the Sacrament of Holy Orders, and the laity. “Before Vatican II” this believe in the Real Presence was universally held on the whole by laity and clergy, and there were no laity administering Holy Communion. If there is a shortage of Priests, that is likely because of a self fulfilling prophecy – the lines between clergy and laity have diminished because of Communion in the hand and lay administration, so why would a young man give up a wife and kids to do what everyone else can do anyway? I am a lay Eucharistic minister in my parish. I wholeheartedly agree that it would be much better if I were not needed in this role. However, in a parish with close to 500 families, a single priest, no deacon, and a single ordained sister who is retiring this month, there is clearly a need. We must all continue to pray, and encourage our young men to explore vocations. As long as the number of priests in this country continues to lag far behind the need, I am afraid we will continue to use lay ministers for more and more duties in the church. As a convert to Catholicism, and as someone who was born after Vatican II, I do not recall attending many Catholic services where there were not lay Eucharistic ministers present. In fact, for pretty much every American Catholic under the age of 50, a large mass without lay Eucharistic ministers would be strange, indeed. This, of course, is not to say that the practice should be continued, but I don’t see the practice going away any time in my lifetime. As a lay Eucharistic minister, I assure you that I approach my role with all seriousness, humility and respect. There is no pride or sense of entitlement or status with this role, but it is a role which I feel called to fulfill within my parish. A large number of communicants is not a valid argument, unless the service would be EXCESSIVELY prolonged. I attend the Extraordinary Form of the Mass (Latin Mass), and EHC’s are not permited. Sometimes we have only one priest, but he is able to give holy Communion to over 700 people, and it only adds about 10 minutes to the Mass. That includes the longer phrase “Corpus Domini Nostri Jesu Christi custodiat animam tuam in vitam eternam” which he says, instead of “the Body of Christ.” Of course, we have an altar rail which really speeds things along. You have never attended any service with “lay Eucharistic ministers present” because the only possible Eucharistic ministers are priests and bishops. Perhaps you attended services with lay Extraordinary Ministers of Holy Communion. The sloppy language commonly heard and the misuse of the terms are proof that the practice of using Extraordinary Ministers of Holy Communion has become much too ordinary and is often abused. The reason for the double consecration of the bread first then the chalice, is to re-present the Body and Blood of our Lord in the renewal of the very same Sacrifice of Calvary at Mass. That is what Mass is – the renewal of Calvary on the altar. The Novus Ordo Mass that is on in every Parish plays down, or even implicitly denies this central reality of the Faith. No wonder why many Catholics think the Mass is a celebratory meal for the community and nothing more. The Priest must consume the Host and the Chalice to consummate the Sacrifice. THe Council of Trent, to which we are bound forever, infallibly teaches that the Host is the Body, Blood, Soul and Divinity of Our Lord under the appearance of Bread. When you receive the Host, you are receiving Our Lord, whole and entire. The dangers of profaning the Blessed Sacrament by administrating the Chalice are much more proximate, communion in the hand notwithstanding. Scott, I heartily recommend finding the Traditional Latin Mass near you and going to it for a while. Read up on it and study it, compare it with what the Council of Trent infallibly taught regarding the Holy Sacrifice of the Mass. Compare it to your local Parish Mass. Maybe google the “Ottavianni Intervention”. It was written by Cardinal Ottavianni to the Pope Paul VI on the eve of the introduction of the New Mass by Pope Paul VI in 1969. I think it is essential to understand the two Masses and be informed of recent Church History, and if you follow through, it will bring enormous spiritual blessings to you in your life. Mass is not about what we get out of it, but what we offer to the Blessed Trinity as fitting and proper worship. If we get anything positive out of it, that’s great too, but secondary. God first. Dip the priest in the Chalice? I don’t think so, Phil! I guess my answer is: Because we can’t make a hybrid rite by pulling things out of one rite here and one rite there and make a new rite. Intinction is not proper to the Roman Rite; there’s nothing wrong with it when it is used in an Eastern Rite. Canon 13 of Session 7 of the Council of Trent says “no Pastor of the Church *whomsoever* can make up a new Rite”. Check it out. The Roman Rite (the Traditional Roman Rite that is) is the fruit of organic development over centuries, even millennia, and is not the sort of thing we can play around with just for it’s own sake, and in fact, we must not. It has slowly developed, carefully and imperceptibly, by holy Popes and Saints over the ages. The traditional liturgy is the very history of the Latin Rite of the Church, the unbroken line directly back to St Peter, here and now, alive in the Church. We are the recipients of two thousand years of continuous, unbroken liturgy! We are bound to only hand on what we have received. Also, the Church has infallibly declared, under the guidance of the Holy Ghost, that it is not necessary to receive the Blessed Sacrament under the appearance of wine, because the whole Christ, Body, Blood, Soul and Divinity are really and substantially present in the consecrated Host under the appearance of bread. Why are so many traditional Catholics and TLM afficianados so hung up on the Council of Trent, yet bash everything that has come out of Vatican II? Was not the same Holy Sprit working in both? If your answer is no, than how would you square that the Holy Spirit was actually working at Trent either? What is your method of discernment. Do yo actually know how God works, other than in mysterious ways? Jay, for the same reason some modern Catholics pretend nothing before Vatican II is binding, instead of interpreting that Council in the light of the previous Councils, including Trent. Complimentary. Especially when the latest Council proclaimed no dogma, which can’t ever change, of course by definition. The Church was not born in 1963, not did she die in 1969. Anyone who reads the conciliar documents, especially Sacosanctum Concilium would see the novus Ordo as going way being what the Council Fathers intended, much less voted for. Partial vernacular, at least for the propers. Most of the innovations of the 1970s need to be recognized as just that. Similarly, trads should recognize that the world was not frozen in time in 1962 and not everything was ideal before the Council. We need to go forward with the vision of Benedict XVI on the TLM mitigating the worse excesses of the modern liturgy and returning to traditional Catholic theology instead of drifting away for futile ecumenism that risks straying to heresy. The Council of Trent was a dogmatic council; the Second Vatican Council was pastoral. Why do you refuse to see Vatican II in continuity with tradition? Additionally, the constant push for communion under both kinds and EMHC’s is a post-conciliar matter, and not a manifestation of any requirement mandated by the Constitution on the Sacred Liturgy. I became convinced of the real presence of Christ in the Eucharist when I started receiving on the tongue and from only the priest. Even if it meant moving across the aisles to his line. I would kneel, but hip surgery prevents this. @Phil, there was actually a priest in my parish in the NY Archdiocese who did that shortly after communion in the hand began to be allowed and people started quarreling about it. He started intincting the hosts as he distributed them…thus rendering communion in the hand impractical! I think he was either trying to make a point or seek a compromise solution, or perhaps a bit of both. The cardinal told him to cease and desist, to stop “mixing rites”. He complied, but I’d like to think he had the satisfaction of his point being made. On the other hand, I encountered an American-born priest in Japan who encouraged people to intinct their own hosts after distribution (wrong for a whole variety of reasons too long to go into here). Intinction is forbidden to EMEs. Priests use it when receiving for themselves, but the appearance is odd, as the Eucharist is Gift, and thereby should be given rather than taken. But it’s not my call. Let us rejoice and be glad and quit the nit picking. The Lord turns all to the Good. Yes, we need Renewal, but not Regression to the days of secrets and lies… Aggiornamento! I believe there are too many Special Ministers at Mass. One of the reasons for this is because some members of the laity like to have a job to do in the parish. Church cleaning is not one of the sought after ministries as was the case when I enlisted in the cleaning rota. Nor is washing and ironing altar cloths and priests albs. I think everyone should be glad that they are able to receive the Eucharist under any species instead of whining if they do not. People in other parts of the world do not always have the chance to go to Daily Mass, or sometimes Mass weekly or monthly. Catholics are being driven from their homes and priests are being murdered. Extraordinary Ministers exist because we are all too selfish to stay at Mass another ten or fifteen minutes. To determine that some churches deny the laity the cup because they are common and only good enough to pay the bills is a delusion, I can only urge you to pray for some healing that makes you feel that way. That is of you, not the Church. For the record, the priest is above you, whether you like it or not, or accept it or not. His life is a sacrifice and HE with the Holy Spirit and the words, bring YOU the Eucharist. Jesus Christ is present. To receive Him, we should be ready to suffer any indignity or humiliation, real or imagined. The overuse of EM’s is just one of several abuses in the NO mass but one that has tremendously normalized” the reception of Holy Communion so much that the host has become just a piece of bread, received in “memory of” Our Lord’s Sacrifice instead of His Real Presence. The whole “my hands are just as good as the priest’s” is a lie and one that Satan would proudly boast, I am sure. Often I see the Eucharist handed out like deck of cards, with parishioners dressed in street, gym or beachwear and then walk out the door immediately after! In the last 50 years belief in the Real Presence among Catholics has dwindled so low that only 30% actually believe Jesus is present Body, Blood, Soul & Divinity as well as more & more churches closing their doors due to low attendance. This is absolutely not the case at TLM. Thankfully rapid growth is happening among young Catholic families as well as many new priests coming out of seminary for the Latin Mass as more & more come to know their Catholic heritage & discover the liturgical richness of the past and want to preserve it for their children–the future of Holy Mother Church. The Holy Spirit is definitely at work to fix the problems that have occurred due to the “spirit” of Vatican II. Sadly, some modern church architectures make it difficult to avoid the use of extraordinary ministers. When you have a large Church-in-the-round with five different aisles and only one priest, the traffic pattern is difficult to manage if only one or two people are giving communion. Given how often reassignments happen, the architecture of the Church is not necessarily a sign of the parish orthodoxy or feelings toward tradition. One priest I know is very orthodox—he even brought the St. Michael’s prayer back—but the Church was built in 1988 “in the spirit of Vatican II”, designed by the former priest’s gay lover. Let’s face it. Eucharistic ministers are sort of creepy. What kind of person needs to be up there “presiding” and needing to feel included by getting to be “part of the show”. Some EM’s are OK, others are downright creepy. Some are lackadaisical, others are so over the top Pius (staring in wonder at the Eucharist) that they make the whole experience bizarre. I am sure there are some very fine people doing this for all the right reasons. I am sure many of them are devoted. BUT THEY ARE NOT NEEDED, EXCEPT AS A WAY TO PRETEND THAT WOMEN CAN BE INVOLVED. It is strictly a political move, one that should not invade the Mass. We have made the mass into a therapy session for some.